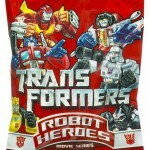 ToyArk.com has received official, high resolution images in and out of packaging for Robot Heroes Blind Packs that will be available in several international locations. The blind packs are being labeled as Movie Series, although all revealed figures thus far are from the Generation One series. Autobot Jazz, Bumblebee, Grimlock, Insecticon, Mirage, Rodimus, Shockwave, Soundwave, and Starscream. Countries or regions where these figures may be included are Germany, United Kingdom, Italy, Spain, Hong Kong, Taiwan, and Malaysia. Click on the image to the left to view all of the package shots as well as the figures revealed thus far to be included in the Polybag Blind Packs.